« Forde finishes fine 11th in National 10k Championships! Superb Season Openers from many of Wexford’s Top Juveniles! The impressive RSC, was the venue for the recent Ferrybank AC Open Sports in Waterford. As ever, the county’s clubs came out in force to support this event, which always draws a good number of participants and for most acts as their ‘season opener’ on the track. With the Mr Oil County Juvenile Track and Field Championships on the horizon, athletes were eager to get race experience and sharpness under their belts. The event started with the Women’s and Men’s Mile. Angela Wall and Clare O’Morchoe of Taghmon were 1st and 2nd in the Masters Women’s Mile. The Senior and Masters Men’s race had a field of 20 taking part. Andrew Connick, formerly of St. Paul’s AC and now wearing the green of Ferrybank, finished 1st. Just behind him was the supremely talented Aedan Rodgers. Rodgers of United Striders AC, had a strong last 400m to move himself into the silver medal position. The sprints followed the Mile races on the track. Ben O’Toole of Taghmon AC, took an impressive win in the Boys U14 100m. Claire Doyle of United Striders took the win in the Girls U18 100m. Clubmate, Aoife Kehoe was 2nd. Adam Leahy of Menapians also won gold in the Junior 100m race. 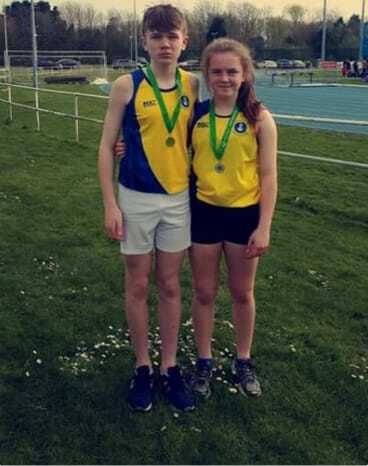 Other Wexford medalists in the sprints included Enniscorthy’s Stephanie O’Connor (2nd U12 80m), Oisin Larkin (3rd U12 80m), Dannan Long (2nd U15 100m), Margaret O’Connor (2nd Masters 100m). Also on the podium in the sprints were Bree AC’s Ava Wilson (2nd U9 60m), Shane Laffan (2nd U10 60m), Jayden Kenny (2nd U11 80m) and Cian Donavon (2nd U12 80m). Taghmon had three bronze medalists in the sprints to add to the aforementioned Ben O’Toole’s success. Chloe O’Toole was 3rd in the U16 100m, Hannah Roche Kelly was 3rd in the Junior 100m and Angela Wall, fresh from winning gold in the mile, finish 3rd in the Masters Women’s 100m. United Striders also won additional medals in the sprints, that boosted their points tally. TJ Murphy was 3rd in the U9 60m and Patrick Doyle, who competed in the All Ireland Triple Jump in Athlone the day before, finished 3rd in the U18 Boys 100m. Kara Morrissey of Menapians finished 2nd in the Girls U13 100m, while her clubmate Anoushka Nolan, finished 2nd in the U16 100m. Sam Molyneux of Kilmore was 3rd in the Junior Men’s 100m and won the gold in the Senior 100m. The Hurdles followed the Sprints. Orlaith Byrne of SBR, climbed to the top of the podium in the Girls U15 race. Orlaith had earlier in the day, finished 2nd in the U15 100m. Bree have a strong reputation of producing, quality hurdlers underlined at the National Juvenile Indoors recently when Darra Casey took home a gold medal. On Sunday last, some of their younger members were attempting to emulate his success. Ciara Laffan and Katie Doyle were victorious in the Girls U12 and U13 races. Abbie Doyle was 2nd in the Girls U14 Hurdles. Brothers Sean and Eoin Lennon of United Striders were 2nd and 1st respectively in the Boys U14 and U16 Hurdles. Conor Whycherly was 2nd in the Boys U14 Hurdles race. His clubmate Eimear Halpin finished 3rd in the U16 Girls Hurdles. Middle distance running is in good health in Wexford at the moment. That was evident last Sunday when Wexford’s top talents brought home several medals. United Striders have great depth in the Middle Distance events and have some great talents coming through at the moment under the guidance of Ted Flannelly. Finn Kelly, took the win in the U15 800m. Ted’s son Darragh, had a massive PB in the National Indoors less than a month ago. In his first Outdoor race of the season, he produced yet another PB and a gold medal, illustrating the rich vein of form he is in at the moment ahead of the County Championships. The Girls U16 800m was nearly an all Wexford affair, with all but one of the starters coming from one of the County’s clubs. 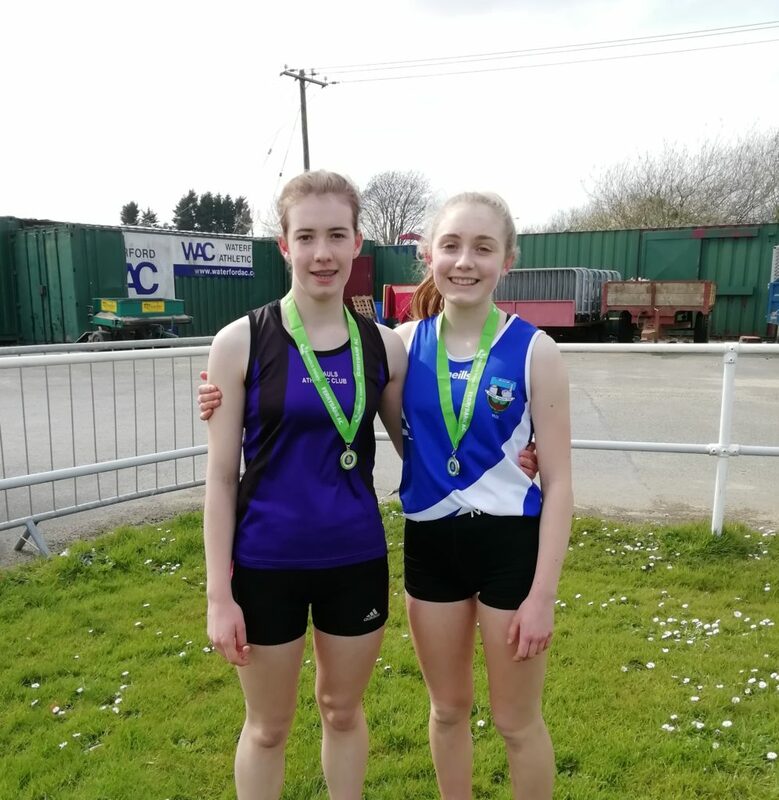 Ciara Martin of St. Paul’s and Eimear Fortune of Kilmore were amongst the favourites, having both made the Leinster final Indoors in the event. The race started with Ciara going out at a lightning pace. Fortune tracked her, but was slightly behind. With 300m’s to go, Fortune and a fellow competitor from Carrick-on-Suir threatened to break Martin’s resilience. Despite their best efforts, they couldn’t and Martin put her foot down to break clear, with Fortune coming 2nd, in a quick race. Danika Gilshinan looked in control in the Girls U17 800m. Danika, who runs for St. Paul’s is the daughter of recent World Championships Masters medalist Anne. Moving strongly from start to finish, her victory was never in doubt and she can look forward to a busy outdoor season now. Definitely one to watch! Rayna Thompson of Kilmore won the Girls U12 600m’s. Bree had a number of young Juvenile athletes who medalled in the middle distance races. Ava Wilson was 2nd in the Girls U9 300m, Hazel Breen was 3rd in the Girls U10 300m, Shane Laffan was 2nd in the Boys U10 300m, Lea Bolger was 2nd in the Girls U12 500m and Cian Donavan was 3rd in the Boys U12 500m. Catherine O’Leary of St. Paul’s was 2nd in the Girls U10 300m. TJ Murphy of United Striders was 3rd in the Boys U9 300m. Sean Lennon, United Striders, was 2nd in the Boys U14 700m, in what was a fast race. Also representing Striders was Rebecca Bawden, who came 2nd in the Junior Women’s 800m, Erinn Shannon, who was 3rd in the U17 race and Aaron Browne who also came 3rd in his U17 race. Sarah Phylan was 3rd in the Girls U13 700m. The Enniscorthy runner had a great cross country season, last year. There was some strong performances in the field events also. Arwyn Thompson of Kilmore won the Girls U15 Long Jump. Ava Wilson of Bree won the Girls U10 Long Jump. Meanwhile in the Shot Put circle, Triini Jurisoo, won the Girls U16 competition with a new PB. Also in the Long Jump, Bree AC’s Katie Doyle was 2nd in the Girls U13 competition. Aoife Kehoe of United Striders was 2nd in the U18 Girls Long Jump. Eimear Halpin was 2nd in the Girls U16 Shot Put. The Menapians athlete achieved a new PB in the process. In the High Jump, Dannan Long of Enniscorthy came 2nd in the Boys U15 competition. Also medalling in the High Jump, was Eimear Halpin, Menapians, who came 2nd in the U16 competition. Her clubmate Triini Jurisoo was 3rd. Nessa Long of Enniscorthy was 3rd in the U11 Turbo Javelin. Jayden Kenny, Bree was 2nd in the Boys U11 Turbo Javelin. Fionn Kehoe of United Striders was 3rd in the U10 Boys Turbo Javelin. United Striders took the win in the Boys U14 4x100m relay. Bree, also had great success in the relays with their U11 and U13 Boys teams winning gold. United Striders took the Overall Best Club cup back to New Ross for the second year running. The massive numbers they had, show the sheer size of Wexford’s biggest Juvenile Club. Bree finished joint second, in the clubs competition, a great result. Attention, for Wexford’s Juvenile Track and Field stars now turns to the Mr Oil County Juvenile Track and Field Championships in Enniscorthy on the 5th and 12th of May. Before that though, there will be one final chance to get some race sharpness in the legs, with the St. Senan’s AC Open in Kilmacow on Easter Monday.